Eggplant is one of my favorite vegetables of all time. Even though, when I was growing up, it only appeared on my Grandma or Mom’s tables fried with marinara sauce (and there’s nothing wrong with that, mind you), fairly early on in life I was introduced to moussaka and baba ganoush through Mom’s Greek friends, Pete and Sylvia, and my Aunt Nancy, who’s half Syrian, and loved all sorts of eggplant-based goodies. (Half Syrian, half Portuguese, and ALL good. I love Aunt Nancy, who lovingly broadened my food horizons from a very early age, God bless her.) My Uncle George, Mom’s brother and Aunt Nancy’s husband, loved Eggplant Parmesan so much that it was the only thing he ordered at Joe Fazio’s when we went out to celebrate his birthday, but even so, he’d let me have a bite to try it when I was very, very small. Fried eggplant, great marinara and melted mozzarella cheese–what’s not to love? But, when I was younger, the only eggplant I knew about or ate was the Rubenesque deep violet aubergines that are commonly grown throughout the Mediterranean and Middle Eastern regions. I’d never heard of, or even seen one of the long, thin, pale violet colored Asian Eggplants that are now fairly commonly seen in farmer’s markets, Asian markets and even some regular old grocery stores around the US. They don’t even really look like eggplants being that they aren’t egg shaped, but are instead slender and curved, like long, stretched out teardrops. Most commonly they are either deep purple, like their plump cousins, or a pretty rosy violet color, but sometimes they are white, or striped violet and white or even a pretty mint green. 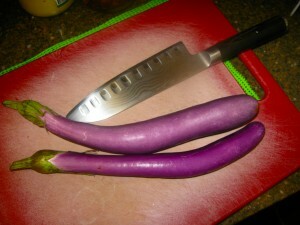 No matter what color these pretty Asian eggplants are, they have several things in common. One, when picked young, they have very few seeds. Two, they almost all lack any of the bitterness which can sometimes plague the more common chubby eggplants, and so never need to be pre-treated with salt. Three, they do share the ability to act as sponges with their larger cousins, and so are very good at taking up and holding flavorful sauces and oils. They are used in the cuisines of China, Japan and Thailand, where their abilities to soak up flavor is used to great effect. In Japan, they are grilled with a miso marinade, in Thailand they are cooked in coconut milk-based curries, and in China, they can be either deep fried or stir fried then served in a sauce. My personal favorite is a Sichuan dish where thin slices or slender shreds of young Asian eggplant are stir fried with minced pork and served with what is technically called, “Fish Flavored Sauce,” but which is usually translated into English as “Garlic Sauce.” The eggplant is soft and slippery and bathed in the darkly sweet, hot, tangy sauce, while the minced pork bits are sweet and a bit chewy. Sometimes shreds or slices of fresh water chestnut are used to add crispness and a shattering sugar flavor to the dish, but I’ve most often had it in restaurants with just the eggplant and pork. Eggplants are madly in season right now–there are piles of them in all shapes, sizes and colors at the Farmer’s Market these days, so I picked up a couple of the little Asian ones to add to some stir fry or another. It wasn’t until I was digging around in the vegetable drawer to find something for dinner a couple of nights later that I came up with this dish which is a twist on the traditional Sichuan Eggplant with Pork and Garlic Sauce that I love, but seldom find in restaurants. Lacking fresh water chestnuts, I came upon some beautiful green beans and decided to use those to make a crispy counterpoint to the richly soft and unctuous eggplant. 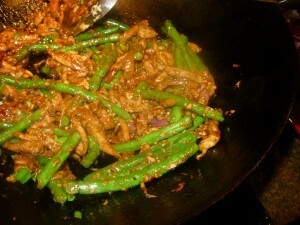 Since the green beans are long and thin, I decided to cut the eggplant into shreds to match the shape of the beans. According to Chinese culinary traditions, matching the shapes of your ingredients is a more aesthetic way to cook, and it ensures that foods cook evenly in the wok. Cutting Asian eggplants into shreds is simple–just cut the fruits into steeply diagonal 1/4″ thick slices so that you are making long ovals, then stack the slices and cut those into 1/4″ wide shreds. Voila–simplicity itself. Instead of mincing the pork tenderloin (which is what I had), I shredded it as well–by cutting it into slices against the grain, and then cutting each slice into a 1/4″ thick shred. When it came to cooking the dish–I put the eggplant into the wok not long after the pork so it had plenty of time to soak up the flavors of the minced scallion, garlic and ginger that is put into the wok on top of the pork. 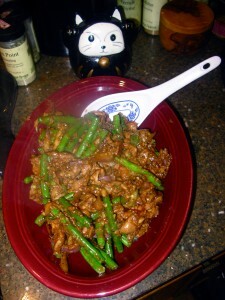 Basically, I waited until the pork was half cooked–the colors showing were equal parts brown and pink–before tossing in the eggplant, and then stir fried as normal, putting in the blanched green beans when most of the pork shows brown instead of pink. Then, in went the already blended sauce components, and within about a minute and a half, the sauce is reduced and thickened, everything is cooked through and all that is needed is a sprinkling of scallion tops to bring everything to a delicious finish. Amazing. Using green beans in a dish of eggplant and pork with garlic sauce may not be traditional, but I don’t care, because it’s damned good. Zak said it was one of the best things I’ve cooked in a long while, and he and I and Kat pretty much ate the entire platter in one sitting. Mind you, I said almost. There was also enough left over the next morning for a nice cold topping over warmed over rice for breakfast. And yeah, it makes a great breakfast, too. Stir together the first eight ingredients–from the vinegar to the cornstarch–in a small cup or bowl until well combined. Set aside. Heat wok over a burner on high until a thin ribbon of smoke spirals up from the steel or iron surface. Pour in the canola or peanut oil and heat for another 30-60 seconds, until the oil shimmers and moves lightly over the surface of the wok. 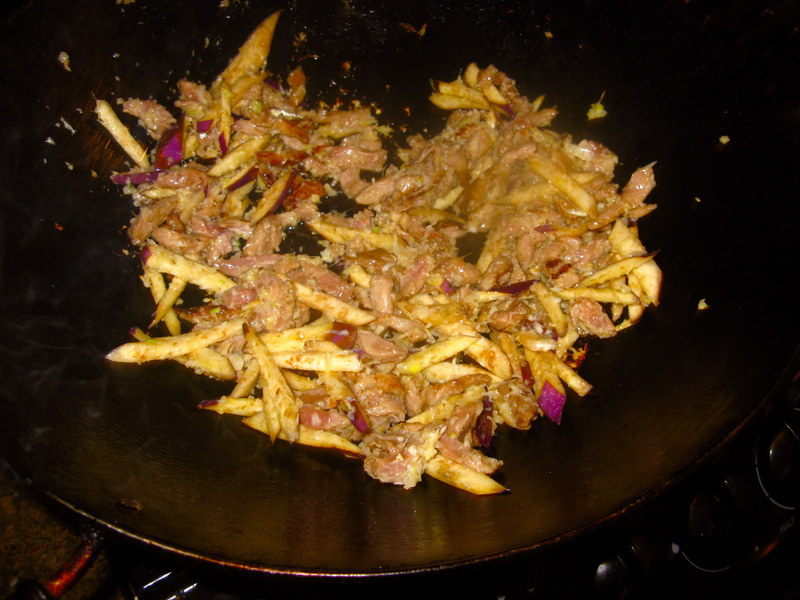 Add the pork in one layer and allow to sit on the surface of the wok, undisturbed, for a minute, or until the meat browns well on the bottom side. As soon as the pork is settled into the wok and arranged so it can brown, sprinkle the minced scallion, garlic and ginger evenly over the meat, then sprinkle the eggplant evenly over that. 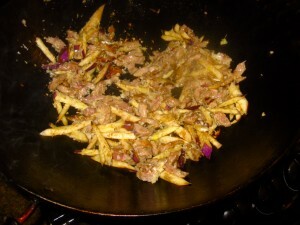 Once the meat is well browned on the bottom, stir and fry until most of the meat is brown with only a little bit of pink showing. Some of the aromatic bits will likely stick to the wok, but don’t worry over that much. Add the green beans and stir fry for about ten seconds, then pour in the sauce ingredients, and cook, stirring and scraping until the sauce boils and thickens and everything is fragrant and cooked through. Stir in the scallion tops, and remove from heat. Scrape into a heated platter and serve immediately with steamed rice. Correction – wood fire, not wood smoke. Roxana–I love baigan bartha! I’ve only made it North Indian style with tomatoes in it which helps the color somewhat,but you’re absolutely right– it is not pretty to look at! I’ll have to try it your way soon while we still have a glut of local eggplants. Growing up, I loathed eggplant – probably because it was bitter and poorly cooked. It’s one of my husband’s favorite vegetables, however, so I’ve made an effort to cook and eat it recently and have discovered that properly prepared it can be quite delicious. Your Sichuan beef and green bean dry stir-fry has become one of my all-time favorite dishes, so I am more than willing to try this. I just wish I’d seen it before went to the farmer’s market this morning, where Japanese eggplant and green beans are abundant. Ah, well – next week, for sure!! Jan, I just made that beef and green bean dry fried dish a week ago and Zak said it was one of the best dinners I’d made in months. He loves it anyway, but this time around, the beans were just plump and juicy to start out with so they turned all chewy without drying out and the beef was particularly good, so it, too went all chewy and delicious, so he was right–it was very good. I’m glad you like that recipe so much, and I hope you like this one, too. Zak and Kat and I loved it, and I want to make it at least one more time while the local Asian eggplants are in season. Ohh, that sounds wonderful and I will have to try it next week, after I go back to the butcher. But you also reminded me that I passed a new Asian grocery on the way home and I’ve been out of black rice vinegar (which I love) since our old one closed; a good excuse to go explore. We were over at a friend’s the other day and he sliced those long eggplants lengthwise and soaked them in coconut milk then grilled them before making a salad. He said he learned that when he was in Thailand (he lived there a couple of years). It was marvelous. Very nicely written and presented. This is the best recipe for pork and eggplant I have come across. I make this often and it is always enjoyable but every time I think it is missing some ‘je ne sais quois’. Your rendition comprises all of the things I love about this dish and the black vinegar and shaohsing are probably the ticket to perfection for me. The addition of green beans is a plus – I love still slightly crisp flash fried green beans with garlic, chili flakes and sesame oil and this dish provides some of that wonderful flavor too. Hen Hao! This version of “fish flavored” or garlic sauce is the one I learned from Chef Huy Khuu who used to own a restaurant in Huntington called China Garden. He has since retired, which is why I feel it is okay for me to publish his recipe–when the restaurant was still open, I kept his secret to myself. His secret is the black rice vinegar mixed with white rice vinegar. Most recipes use one or the other, not both, but his–his is the best. The Shao Hsing wine also gives it an amazing depth of flavor.